Large Bore Threaded Valve for single drive wheels, 1.62 valve height. Faster inflation/deflation of giant tires, compatible with 1/2″ & 3/4″ NPT. 211 HN-1 Hex Nut Fits 0.486-26 threads on large bore valves and extensions. Brass – 5/8″ hex. 265 HN15 Hex Nut Fits 0.6875-16NS thread. Brass – 15/16″ hex. 301A - Extension 90 degree bend, 3.66″ effective length. For tube valve application. 302A - Extension 80 degree bend, 1.78″ effective length. For tube valve application. 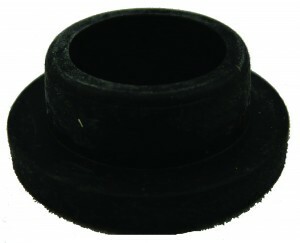 447 RG-7 Rubber Grommet Fits VS-714A (TR 618A-623A) air/liquid valves, fits 0.625″ valve hole. EPDM rubber. 452 RG-67 Rubber O-ring Fits 6489A (TR CH3) core housing. Nitrile rubber. 454 RG-22 Rubber Grommet Fits VS-977 (TR SP2) spud, fits .812″ valve hole. EDPM rubber. 457 RG-66 Rubber O-ring Fits large bore swivel valves. Nitrile rubber. 459 RG-16 Rubber Grommet Fits turret type valves, fits .812″ valve hole. EDPM rubber. VS-977 SP2 Valve Spud Tubeless spud for large bore swivel valves, fits 0.812″ valve hole. 6489A CH3 Core Housing Standard bore, o-ring seal, Octagon gripping feature. CH-3D CH3 Core Housing Standard bore, o-ring seal, Knurl gripping feature. CH-8 CH8 Core Housing Used with large and super large bore valves utilizes an O-ring seal. SP8B SP8 Clamp-in spud For 0.812″ valve hole. Tire must be dismounted from the rim for assembly. Spud is securely tightend into the valve hole with a hex nut. 8807 AD1 Adapter Reduces large bore to standard bore. Fits inside .305.32 valve core thread. 9061 AD1 Adapter Reduces large bore to standard bore. Over .485-26 valve cap threads.